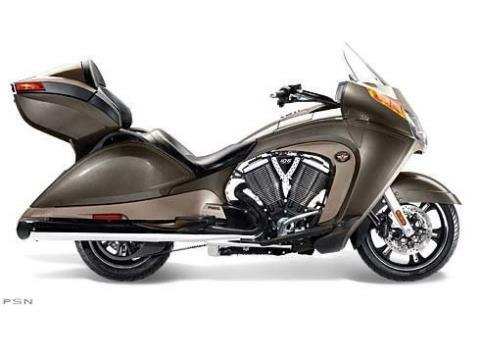 At the heart of the Vision Tour sits the Freedom V-Twin power plant, expertly balanced for the perfectly controlled explosions that deliver 97 horsepower and 109 ft. lbs. of hole shot torque. Maestro of the motorcycle world, it’s what keeps man, machine and highway working together in perfect harmony. 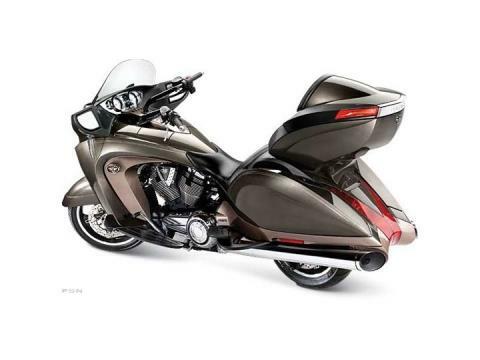 True to the bike and shaped by the wind itself, the injection-molded trunk and saddlebags provide enough storage space to comfortably get you and a friend all the way to points unknown. Don’t hesitate to bring everything you could possibly need for the ride - even the all-important hair dryer. Standard on the Vision Tour, the Victory Anti-Lock Brake System doesn’t discriminate between dry, wet or rock-strewn pavement. No matter what the conditions, ABS monitors what the wheel is doing and gives you consistent, smooth braking from the handlebar lever down to the rubber on the road. The Vision Tour lacks for nothing in the comfort category, and as proof we offer up heated seats and handgrips as exhibit A. Together they offer the best means of enhancing your road warrior reputation, by adding precious road time to both sides of summer. Some riders feel they’re not getting their due without wind in their face. Others prefer calmer days in the saddle. With the push of a button both get their wish – power the windshield up for full protection with wraparound faring, or slide the windshield down for the gentle wash that comes with the ride.